FlexCell is a flexible and easy to use grid control. Using FlexCell Grid Control, you can create the professional user interfaces and report form in your application. 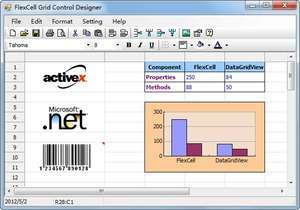 FlexCell Grid Control provides comprehensive functions such as Print, Print Preview, Chart, Merge Cell, Virtual Grid, Import (from) and Export (to) XML, Export to Excel Workbook (no need of Excel runtime support), etc. It provides 6 cell types and 9 programming objects. FlexCell Grid Control 6.3.3 is a shareware program and can be used as a demo to try the software until the free trial period has ended. A full version of the program is available after the trial period ends. For security reasons, you should also check out the FlexCell Grid Control download at LO4D.com which includes virus and malware tests. Additional screenshots of this application download may be available, too.